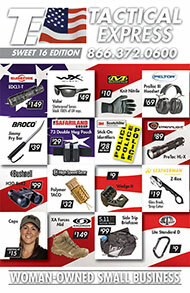 Prices are for federal law enforcement agencies only. Sales policies, item availability, and prices are subject to change without notice. We are not responsible for typographical errors that may appear in this catalog. Product returns may be subject to a 15% restocking fee. All rights reserved. All product names throughout this site are trademarks or registered trademarks of their respective holders. All images featuring people throughout this catalog are for illustrative purposes only and do not imply endorsement or connection to the products or services. You may voluntarily sign up to be informed about certain offers. For these services we need only an e-mail address, which we use to send the information you requested. We may also use the information we collect to occasionally notify you about important changes to the Web site, www.tacticalexpress.com, services and special offers we think you'll find valuable. If you would rather not receive this information, please notify us. Make sure to notify us for each account or e-mail address you have left with us. How Does Tactical Express, LLC (www.tacticalexpress.com) Protect Customer Information? Secure Sockets Layer (SSL) technology is presently the safest way to send credit card information over the Internet. Information is first encrypted on your computer, then decrypted on our side, preventing anyone from accessing any information in between. To ensure your security, we require the use of SSL-capable browsers, such as Netscape (version 3+) or Microsoft Internet Explorer (version 3+), to check out on our site. Credit card numbers provided by our customers are stored in encrypted form in our database and are not viewable by any unauthorized personnel. Intermediaries are used only to handle credit card processing and product fulfillment. A third party credit card verification company handles all credit card processing. Orders are processed and shipping by only the most reputable suppliers of computer products. Will Tactical Express, LLC (www.tacticalexpress.com) Disclose the Information it Collects to Outside Parties? Tactical Express, LLC (www.tacticalexpress.com) does not sell, trade or rent your personal information to others. We may choose to do so in the future with trustworthy third parties, but you can tell us not to by sending a blank e-mail message to Tactical Express, LLC (www.tacticalexpress.com). If you use more than one e-mail address to shop with us, send this message from each e-mail account you use. Also, Tactical Express, LLC (www.tacticalexpress.com) may provide aggregate statistics about our customers, sales, traffic patterns, and related site information to reputable third-party vendors, but these statistics will include no personally identifying information. We are committed to protecting your privacy. We use the information we collect on the site to make shopping at Tactical Express, LLC (www.tacticalexpress.com) possible and to enhance your overall shopping experience. We do not sell, trade or rent your personal information to others. We may choose to do so in the future with trustworthy third parties, but you can tell us not to by sending a blank e-mail message to privacy@tacticalexpress.com.